Back by popular demand, the simple, no frills bass booster that has become a sought after treasure in the bass community. These are being made to order, and are available only through our custom shop, so please allow 7-10 days for delivery. You may be thinking, “Oh no, not another clean booster…”. So what makes the Phat Phuk Bass Booster different? This booster is made specifically for the bass guitar. It was designed to accommodate tunings down to a five string’s typical low B and can be used for even lower tunings. This booster was not made to be “transparent”. It’s not a JFET or MOSFET based booster. There are many fine boosters out there that are designed to be “transparent.” If that’s what you’re after, the Phat Phuk may not be for you. A JFET is used in the Phat Phuk however, more on that below. The Phat Phuk is a JFET/germanium single circuit hybrid booster. There is a double booster I know of with two independent boosts, one being a germanium, one JFET based. It’s actually a very fine pedal. Perhaps there is another single circuit JFET-germ booster out there, but I’m not aware of it. Pink Sparkle Paint with a solid pink base coat. Then a durable clear-pink sparkle top-coat. The base coat and top-coat give a deep gorgeous finish. 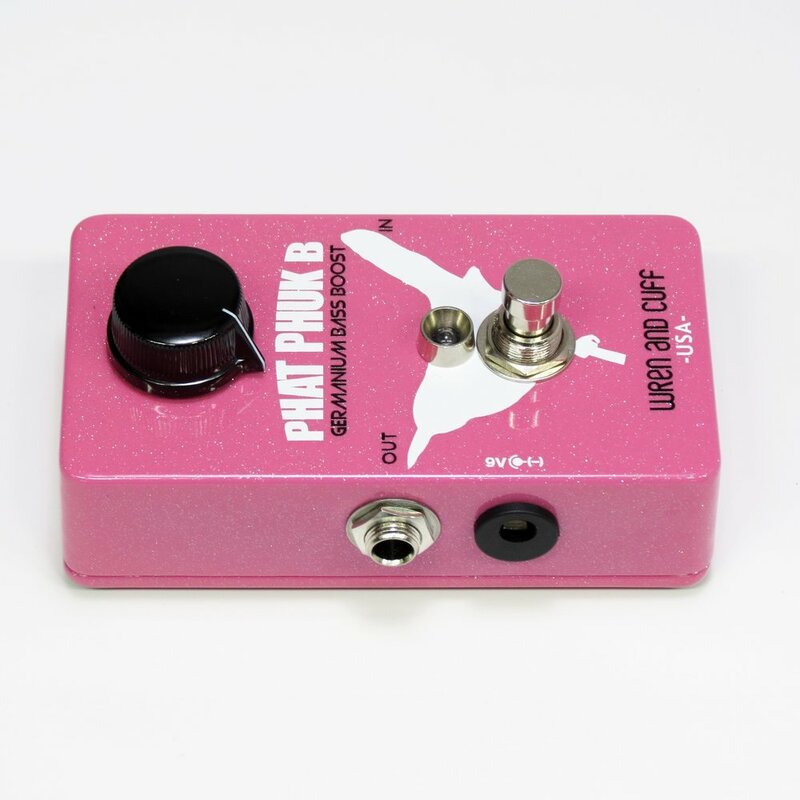 You gotta be a confident man to have a pink pedal, or a girl who happens to like the color pink. A germanium/JFET booster. A unique sounding pedal which adds a beautiful sheen to your bass’ top end and a bit of grit to the overall tone. It’s a fantastic pedal for situations where you want a lift in your overall level, during a chorus or bridge for example, with a bit of bawdy bump via the germanium transistor. One nice feature is also the more modern JFET transistor at the input which keeps the pedal impedance-friendly when it comes to active bass pickups. 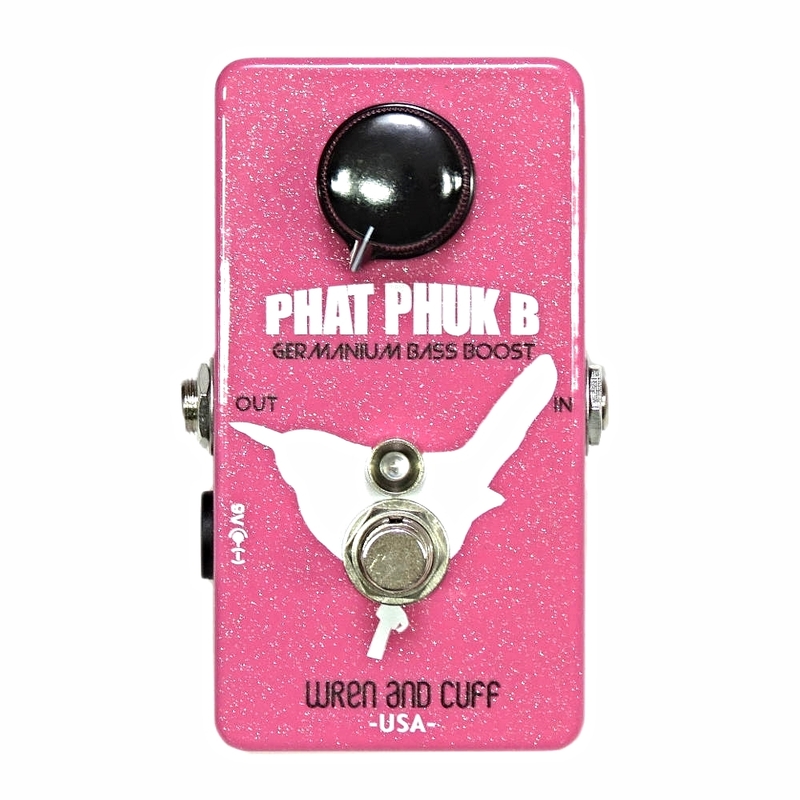 This helps the Phat Phuk to remain consistent whether you put a P-Bass in front of it, or a Warwick Thumb. Another recommended use: As a simple preamp when going direct into your DAW. Helps to de-sterilize your bass’s direct tone and add a little life before the signal is converted to ones and zeros. Something else that was considered when creating the Phat Phuk B. Many clean-boosts offer way too much boost in my opinion. In any normal playing situation, including intentionally slamming the front end of a tube amp to induce the amp’s natural overdrive, one really only needs a hefty thump to get the job done. There’s nothing wrong with having a large amount of volume on tap, but a problem that can sometimes occur is a lack of ability to fine tune the amount of boost you want. When the sweep of the knob goes from zero to melt-down with one turn of the knob, it gets tough to really dial in a precise amount of boost. Also a slight bump of the boost knob (with a foot or nervous “live show” jitters) can send things out of control. I know because its happened to me. Went for the big chorus during a song, hit the clean boost (not mine, this was long before Wren and Cuff existed) and tore the heads off the people in the front, pissed off the sound man, and pretty much ruined that song. Therefore, the volume sweep was reduced with the Phatty. You still get a big gob of gain, and probably won’t ever need to run the pedal “at 11″, but the trade -off is worth the extra control. Just an example of what Wren and Cuff prides itself on: pedals that sound superior, look beautiful, can take a beating, and are made with the “real world” player in mind. In other words: A meticulous attention to detail. Check out the demo vid, but please know that it is 8 years old! The quality isn't the best, but the info is still 100% accurate.